Despite the fact that Hickeys Music lists five pages of repertoire for unaccompanied trombone, there is only a small handful of works that are performed regularly and are programmable by undergraduate university trombonists. 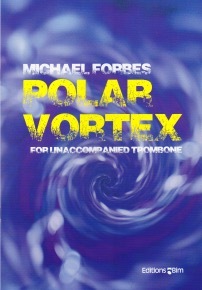 Composer Michael Forbes, former tubist for the U.S. Army Band, “Pershing’s Own,” aimed to remedy this situation with his work, Polar Vortex. Although originally written for tuba, this piece works quite well on tenor or bass trombone. Melodic material has been moved up in range to cater to the trombone tessitura, but after a deeper look, it strikes me as odd that while the main interval of shift is a minor-seventh, there are times where that interval changes – sometimes to an octave, other times to a minor tenth. There may be more changes, but I was only able to analyze the incomplete sample tuba version online. The piece characterizes the blast of arctic-like weather that occurred in the early weeks of 2014 in the United States by means of fast chromatic runs, wide interval leaps paired with drastic dynamic shifts, interjections of slower, haunting material, glissandi, and a wide variety of meters including simple, compound, and asymmetrical. As previously mentioned, the work is playable by talented, undergraduate trombonists, but it is not without its virtuosic passages. For example, the performer needs to be skilled in slide technique not only due to several purely chromatic passages, but also due to extended use of the longer positions. One will be using plenty of G-flats, F-naturals, and E-naturals in fifth, sixth, and seventh positions, respectively, in more than one octave. Range is accessible to both tenor and bass with the lowest note being an E, excluding one BB-flat, and the highest note, a single b-flat1. I look forward to playing this work myself and assigning it to students in the future!